The past 15 years saw the most rapid decline in global poverty ever, with the Millennium Development Goals (MDG) of halving the global poverty rate reached several years ahead of schedule. Building on this, governments around the world committed to a new set of Sustainable Development Goals (SDGs), including ending extreme poverty everywhere by 2030. The pathway to achieving the SDGs will be qualitatively different from that which worked for the MDGs. In the MDG era, large, rapidly growing economies—including China, India, Indonesia, Bangladesh, and Ethiopia—drove development advances. Indeed, the world met the poverty MDG despite the fact that many of the poorest countries made little to no progress. Success during the SDG era, in contrast, depends precisely on what happens in these poorest countries. To achieve the goal of ending extreme poverty everywhere, we need a strategy that ensures no country is left behind. This paper outlines such a strategy. 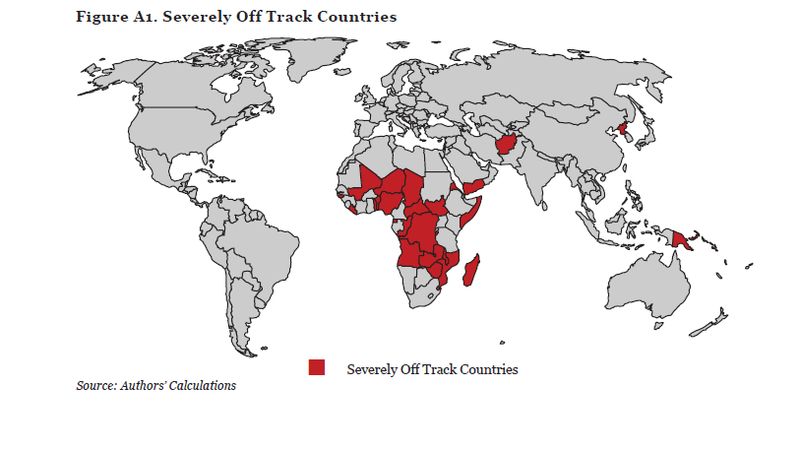 First, it identifies those countries most at risk of being left behind: places we refer to as severely off track countries (SOTCs). Second, it diagnoses four core obstacles to development in these countries: low government effectiveness, weak private sector, conflict and violence, and natural hazards and environmental risks. Third, it suggests three ways in which partner country governments and donors need to adapt their standard practices to help countries get on track to ending poverty. To determine which countries are least likely to end extreme poverty by 2030, we project poverty rates for 195 countries around the world using the poverty line of $1.90 a day in 2011 purchasing power parity (PPP) terms. Based on current trajectories, 31 countries will have extreme poverty headcount ratios of at least 20 percent in 2030, our threshold for identification of SOTCs (see Figure A1). This group includes countries where poverty is falling, but from extremely high initial levels, as well as countries with moderate poverty but who are expected to make only minimal progress in coming years. We estimate that, by 2030, four out of every five people living in extreme poverty will be in the 31 SOTCs. Are there common development challenges among SOTCs? Of the 31 countries, 24 are on either one or both of the World Bank’s Fragile States list and the Fund for Peace’s Fragile States Index. Yet the term “fragility” encapsulates many different concepts and masks important variation across countries. For this reason, rather than focusing on fragility, we look at four underlying obstacles to development that contribute to persistent poverty in SOTCs. Low government effectiveness: 16 of the SOTCs have low government effectiveness, defined as the government’s inability to administer and enforce rules and deliver services. Countries with low government effectiveness are unable to implement the policies that they have agreed to in principle; their bureaucracies are rife with absenteeism and corruption, and they struggle to provide basic services. Weak private sector: 22 of the SOTCs have weak private sectors, where firms face significant obstacles to doing business, resulting in limited domestic and foreign investment. While there are often potentially profitable opportunities for the private sector even in very poor countries—in sectors including but not limited to natural resources—a series of market and government failures may make it difficult to realize these opportunities or translate them into financial gain for the investor. Conflict and violence: 12 SOTCs have high levels of conflict and violence. Organized violence often occurs in repeated cycles and at times spills across borders, disrupting development, destroying infrastructure, and breaking down social trust. Given the high costs of violence—in human, economic, and social terms—supporting conflict prevention is often a sound investment for both governments and donors. Natural hazards and environmental risks: Six SOTCs have significant natural hazards and environmental risks. Those living in poverty are often most vulnerable to natural disasters; they are more likely to live in risky areas such as alongside rivers and floodplains, and lack access to social services, infrastructure, and political processes that could mitigate or help them adapt to hazards. Countries with high risks of natural hazards face a dual challenge: enhancing resilience before disasters hit and improving humanitarian responses in the aftermath of events. Our analysis suggests almost all SOTCs (28 of the 31) have significant challenges in at least one of these four areas, and 18 in multiple areas. To avoid being trapped in cycles where short-term success against one obstacle is offset by relapses in another, SOTCs must progress along a broad front. Given the scope of this challenge, the only way to achieve sustained development is through partnerships between SOTC governments and the international community. Working together, donors and SOTC governments can develop action plans for getting countries back on track to end extreme poverty. Yet current international assistance to SOTCs is not commensurate with the scale of their development needs, nor is it designed to maximize effectiveness. SOTCs received 23 percent of global country programmable aid in 2015—a relatively small share when set against our projection that 80 percent of the world’s extreme poor will live in these countries by 2030. On average, per capita aid is about the same in SOTCs as other countries, but considering the far larger development needs and lower scope for mobilizing non-aid resources (domestic and foreign), this leaves SOTCs at a financial disadvantage. Moreover, while some SOTCs are “donor darlings,” others are “donor orphans,” largely neglected by the international community. Reimagine scaling up. If a development intervention is financially profitable, market forces can be used to generate scale. If it aligns with a government’s mandate and interests, the government can roll out a program at scale by replicating across local, provincial, and national bureaucracies. In SOTCs, however, neither the market nor the bureaucracy pathway is reliable. Private markets are often shallow and inefficient, and government bureaucracies are under-skilled and ineffective. This means donors and governments must reimagine how to scale up successful interventions, including through lowering transaction costs for private investment, supporting domestic resource mobilization and institutional capacity building, and experimenting with how to integrate successful local programs into a national network. Redefine country ownership. The New Deal for Engagement in Fragile States, signed in 2011 by several endorsing organizations as well as many countries, urged donors to partner more closely with recipient governments and work through their country systems whenever possible, even in difficult contexts. Partner countries in turn promised to strengthen their systems and build better state capabilities. In practice, however, donors have been reluctant to use country systems that they view as corrupt or inefficient, while partner countries’ efforts to improve capacity have fallen short. This partly explains why the New Deal has achieved only modest take-up to date and why aid to fragile states has been falling. To overcome this binary choice between (perceived) inefficient reliance on country systems versus bypassing government systems altogether, donors should experiment with new forms of country ownership. For instance, in the transition period following Liberia’s civil war, donors partnered with Liberia’s government through the Governance and Economic Management Assistance Program (GEMAP), an innovative model where donors and government officials shared responsibility and oversight for improving core government functions. Similar compact-based approaches might be applicable in other SOTCs. Rethink results-focused metrics. Over the past decade, international development agencies have embraced monitoring and evaluation frameworks that emphasize measurable, time-based metrics to track success and improve accountability. While this more rigorous approach to evaluation has produced many benefits, it can backfire in SOTCs, where development progress is often non-linear, success takes decades, and it is impossible to define interim benchmarks precisely based on international best practices. Rather than evaluating projects against a predetermined set of time-based metrics, donors should consider granting greater autonomy to in-country offices, allowing them the flexibility to respond to changing circumstances and tailor their work to specific local contexts. Relatedly, donors should review their risk management strategies for SOTCs and make them less risk averse. Given the scale of the development challenge in SOTCs and the need to experiment with new approaches, some setbacks and failures are to be expected; donors should adjust their internal policies to allow for this. The world is shifting from an era where poverty was concentrated in large, rapidly growing economies to an era where poverty will increasingly be concentrated in a number of smaller economies facing deeper structural challenges. This shift has important implications for international development prospects, as well as for strategies to accelerate progress on the SDGs. SOTCs are now the heart of the development challenge, and should be the focus of the international community’s attention. The good news is that micro evidence—from both public sector aid projects and private sector investments—suggest development interventions in these contexts can be successful and profitable, just as they are in other developing countries. The challenge, for both donors and governments, is how to move from individual successful projects to sustained countrywide progress, given the significant development obstacles in SOTCs. This is arguably the most urgent question in development today. This paper has outlined some principles to guide strategies for ending poverty in SOTCs, but much more research—particularly at the country level, adapted to local contexts and reflective of country-specific constraints and opportunities—is needed to develop actionable country plans.